The first stage of the Red Cross's on-the-ground mapping exercises are wrapping up and I wanted to provide an update to all the incredible volunteers who got us this far. Your contributions to OSM were huge to us in Gulu, where we led a training on GIS basics for 12 Uganda Red Cross Society members. OSM in Gulu was used throughout to ground the course in real data: our GPS exercises were about collecting data for OSM and our mapping sessions made heavy use of the Gulu data. Uganda Red Cross staff were pretty delighted to see their contributions go right into the map. As our project is just getting under way, we've only begun to scratch at the surface of what's possible. The next step will be to use the data at hand to make in-house maps identifying the most at-risk areas in Uganda. See the attached map made by the American Red Cross and the Ugandan Red Cross Society during our training for an idea of where we're going with this. As we narrow our focus on specific neighborhoods and communities within Gulu, we'll come up with a hit list of critical infrastructure to be mapped and design a curriculum to collect it. This map is very much alive. Having the basic infrastructure in place means the world to us, and we owe it all to you. 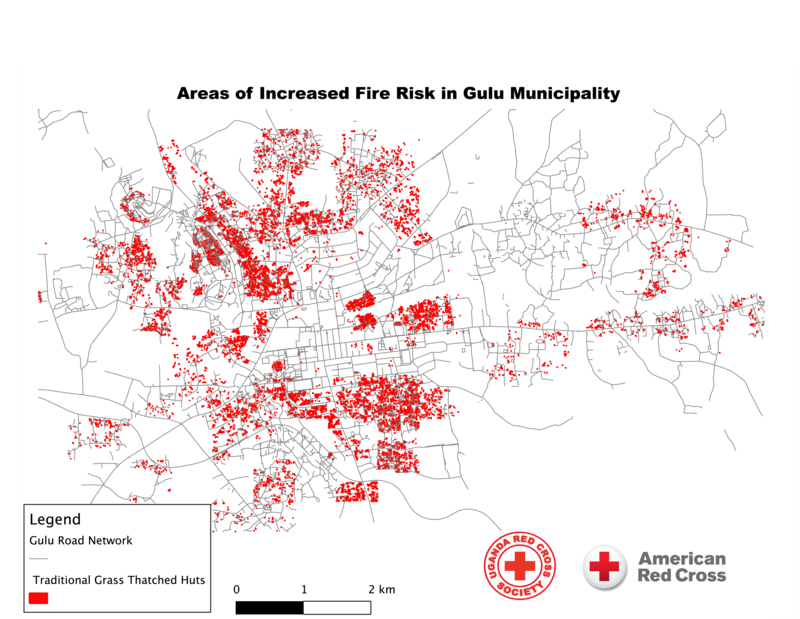 On behalf of the American and Uganda Red Cross Societies, thank you to all of the volunteers and HOT members who put time and effort into making the maps of Gulu and Lira as incredible as they are. A lot of people inside the Red Cross, myself included, are blown away by the quality of these maps and the possibilities they create for us. We're in the very unfamiliar and totally fantastic position of having more data than we know what to do with and we're quite excited to see what innovative stuff we can come up with now. We'll be sure to share any successes that emerge. A final note (and appeal): Lira still needs a little bit of love, particularly in the hut tracing department. As the attached map shows, knowing where these huts are an effective rough proxy for any number of social vulnerability indicators. Thankfully, Bing just contributed some very high resolution imagery which can be used to trace the remaining roads in huts in the Lira area. Anyone who has free time and energy to commit to mapping the huts of Lira would earn our eternal gratitude. I'll be pitching in to do the same in my free time. Again, my sincerest thanks to all of the volunteers and HOT members who contributed to this project. You all have helped prove the value of crowdsourced mapping to the Red Cross and opened a lot of eyes on this end. Thank you.